Textile Forum’s 30th show lived up to expectations with attendance some 10 per cent higher than for the March show this year. While British designers made up most of the visitors, there was the usual sprinkling of overseas customers, this time particularly from Russia and Eastern Europe. “Textile Forum always has a high percentage of returning visitors who know that in addition to our regular exhibitors with their new collections there are always new companies to explore and this October we had some fantastic first time participants,” says event director Amy Packham. Among then was Vema, which produces its embroidered trimmings and appliqués on its own looms in Italy. Paola Mazzuchelli, general manager, was “very happy” with the show and delighted to meet “nice buyers who were genuinely interested”. Also pleased were jacquard specialists Vanners. 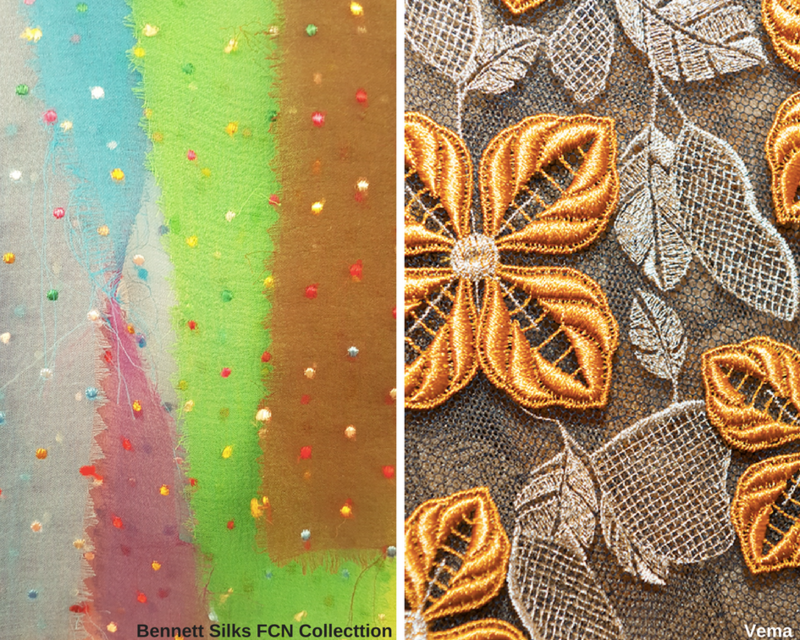 There were also new collections to be found among one of the show’s longest participating exhibitors, Bennett Silks. Owner Mike Bennett has become a major shareholder in FCN, a 100 year old, specialist French weaving business which supplies major couturiers with broche, file coupe and jacquards. “With this investment we are now manufacturers which gives us a lot more options, including producing our own Bennett Silks range of specialist woven silks,” explains Mike. Garment manufacturers Plus Samples was delighted to meet a number of new designers specialising in lingerie, daywear and evening wear. One of its customers Jennifer Ison of Jennifer Anne said that Textile Forum was really excellent. The March show will continue to bring even more fresh and exciting fabric collections together in the heart of London. “We were delighted that several potential exhibitors who are producing fabrics that we have not previously been able to offer in depth visited last week and were so impressed that we have secured their participation for our spring show,” adds Amy. In 2018 Textile Forum will run from 14-15 March and from 11-12 October 2018.